"Both homey and sophisticated..." I think Dorie got this dessert exactly right. It was also a perfect dessert for a summer evening. The sponge cake is light and airy and the filling is sweet but not sickening, creamy without being heavy. The blueberries are a nice pop of flavor especially because they were cooked in sugar. My kids loved making seltzer with the left over blueberry syrup... not for me but they found it novel. My 10 year old pastry chef had never made a jelly roll before and was quiet excited by the prospect of it, of course the instructions were not specific enough, and my daughter forgot to line the baking sheet with a non-stick liner, so the first cake stuck. We enjoyed nibbling on the broken pieces while she made another cake. The trials of learning to how to cook something new. Fortunately, the night we served this roulade for dessert we had a light meal of black bean tortillas which left plenty of room in our bellies to feast on this heavenly cake. We have already decided to make this dessert for friends that are visiting us from Bulgaria next week. I can see trying different berries in it, even peaches might be nice. A wonderful, versatile cake... great ONE! WOW - this looks SO good! 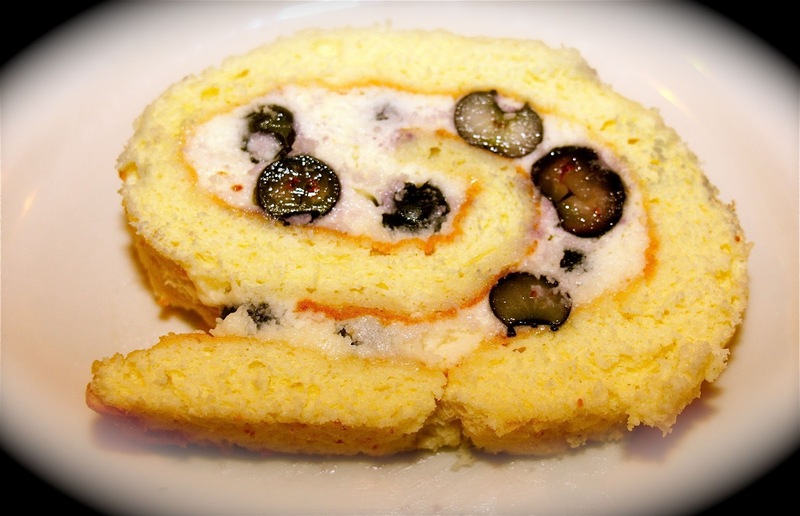 The looks of it reminds me of the jelly rolls my mother use to make, but I like your Blueberry Mascarpone filling SO MUCH better! I haven't been so excited by a dessert in a long time. It is heavenly. Everyone seems to have enjoyed this dessert. It was my first roulade but Dorie was clear about each step. Laughed about the parchment paper being forgotten. She'll never do it again. That's how you get to be a good cook and baker, making mistakes. Hopefully your unplugging for the week-end will become a nice habit. Sometimes it all becomes too much. How is the NY Times commitment doing. Every so often I get them piled up --- I can't throw a section away until I've scanned it, at least. You are right, you have to make mistakes to become a great pastry chef. I have been pretty good about unplugging by 8 pm, but my housework seems to sometimes delay my reading time. I just spent the last week unplugged and I actually caught up, even on book reading. I hate to miss anything in the times too, always so many interesting articles. Wow. Just wow. Your family is so lucky to have someone to make amazing things like this for them! I made something like this once using guava paste and cream cheese- it was marvelous! Diane, what a wonderful thing to do, baking with the children! I am amazed that your ten year old manged to bake this roulade, my compliments to your young pastry chef! The Blueberry Roulade looks wonderful and summery and I agree that it was not too sweet but just delicious. Thank you so much for your comment. My daughter has been baking with my husband since she was little and we have always let her experiment in the kitchen, even if it means a big mess. This last year, she has just taken off, reading and working on dessert techniques. I agree it it is amazing. 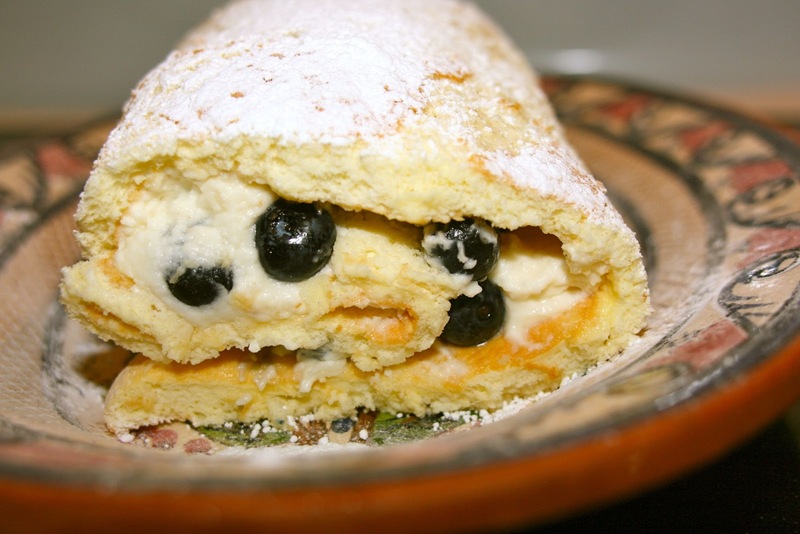 I love your post and the roulade looks DELICIOUS!!!!!!! !